10 Tips for Safe Snowmobiling | Hupy and Abraham, S.C. Snow is falling across the Midwest, and snowmobiling season is in full swing, encouraging those of us in the snowmobiling community to promote safe riding by working with clubs, dealerships and safety advocates to conduct snowmobile safety courses, seminars and clinics. As advocates for recreational safety, Hupy and Abraham supports the movement to expose people to safe snowmobiling practices and to demonstrate how the safe operation of a snowmobile can prevent dangerous and even deadly mishaps. As studies from the last decade indicate, snowmobile accidents contribute to 14,000 injuries and 200 deaths per year. Snowmobile accidents are most often the result of collisions with trees or other fixed objects with excessive speed or alcohol impairment as the most common contributing factors. Make sure your snowmobile is registered with the Department of Natural Resources. Never consume alcohol or drugs before, or while snowmobiling. Stay on trails and areas where snowmobiling is permitted, and always use caution when crossing roads with automobile or pedestrian traffic. Using extra caution at night. If possible, never ride alone. But if doing so, be sure to let someone know where you are going and when you plan to return. Always carry a winter emergency kit. With 53,179 snowmobiles sold in the U.S. during 2018 alone, safety is more important than ever. For more safety information, click here for a free Snowmobile Safety Brochure! While personal safety is one of the most important factors when snowmobiling, the dangerous actions of others also can cause preventable injuries and fatalities. 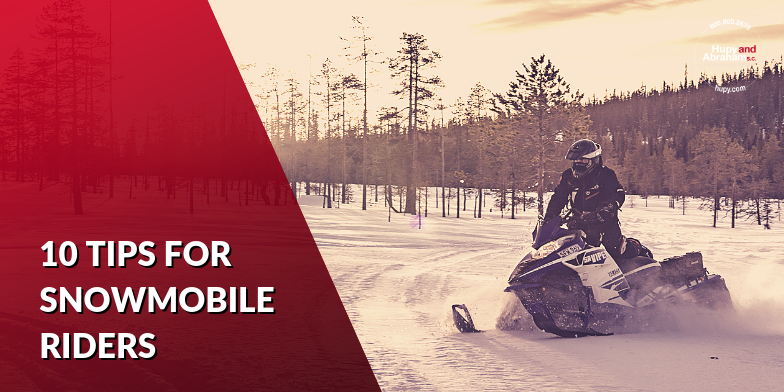 So when a snowmobile rider is injured by someone taking unnecessary risks such as drinking or speeding, injured victims have a right to be compensated for their preventable injuries. If you have been injured in a snowmobiling accident, contact the personal injury experts at Hupy and Abraham for a free, no-obligation consultation. Call 800-800-5678 or start a live chat with us anytime at Hupy.com.